The RXMD DriveSure, from the Watson-Marlow Fluid Technology group, can be used to deliver cooling fluid during ablation procedures. A medical device that manages the movement of a gas or a fluid relies on a pump to carry out the application. Advances in technology enable pump suppliers to provide pumps capable of addressing increasingly complex medical device requirements. But industry pressures are also changing the nature of the relationship between OEMs and their suppliers. KNF pumps are found in a range of products, such as laboratory equipment, diagnostics devices, ophthalmology systems, and air pressure cuffs for blood pressure monitors. While KNF makes pumps used in many industries, Vanderbeck said medical devices call for capabilities unique to the medical field. For example, the aspiration of medical waste requires pumps that can transfer both liquids and gases. Vanderbeck said a diaphragm pump suits the requirement because it doesn’t have any sliding seals that can wear down and contaminate a liquid, or be damaged by a liquid/gas combination. Wilson said that one of the requirements KNF hears customers often cite is energy reduction. Reducing the amount of energy a device requires in turn reduces how much heat it generates. When a device is going into an operating room, clinicians want a product that won’t take up a lot of space and won’t create a lot of noise or heat, Wilson said. Some pump makers specialize in particular types of pumps. Watson-Marlow Fluid Technology Group specializes in peristaltic pumps, which move fluids in products such as bone drills; ear, nose, and throat surgical devices; and other surgical equipment. The pumps are used for irrigation, waste removal, or rinsing, though they can also be used for cooling or other medical applications, explained Rodd Turnquist, sales manager for the Britain-based company. “Peristaltic pump technology is well-suited to these applications because users can dispose of the tubing after each procedure, ensuring that no dangerous cross-contamination can occur,” he said. Watson-Marlow sees growing demand for its pump technology in radiofrequency ablation, a medical procedure that employs heat to remove tissue in a way that is less invasive than other surgical options. In this application, peristaltic pumps circulate water to cool the areas surrounding the tissue that surgeons are targeting. Related to RF ablation devices, Turnquist said his company is seeing demand for pumps that can handle higher operating pressures. Since the RF ablation catheter has a narrow diameter, the back pressure is high, as is the necessary pump operating pressure, he explained. Watson-Marlow’s peristaltic pumps offer pressure capabilities up to 100 PSI. KNF Neuberger manufactures gas and liquid diaphragm pumps used in a wide range of medical device and diagnostic applications, including biopsy collection, tourniquets, ventilators, and immunoassay and clinical chemistry analyzers. Because peristaltic pumps are a niche product, OEMs who seek out these pumps typically understand their capabilities, Turnquist said. Like other medical device suppliers, Watson-Marlow sees OEMs shifting demand toward smaller types of pumps, which in turn, drives demand for pumps that can handle higher pressures. Another factor that OEMs need to consider for peristaltic pumps is selecting appropriate tubing. Because the pump and the tube work together, the medical device design must consider the tolerances of both components in order to ensure optimal performance, Turnquist said. He added that sometimes OEMs present designs that aren’t suitable for peristaltic pumping. In those instances, Watson-Marlow may refer them to manufacturers of diaphragm pumps, piston syringe pumps, or other products. Improvements in motors are a key part of the advances in pump technology. Years ago, pumps were operated by a motor that was either switched on or off. A motor running at 100 percent can provide more performance than a system needs, which leads to more pressure, stress, and flow, Vanderbeck said. The result is more wear and tear, and a shorter life span for the pump, as well as the other components. Brushless DC motors now offer more control, Wilson explained. With control, pumps can operate with less noise, varying speeds, increased efficiency, and less energy consumption. The use of pressure sensors and flow sensors enables device makers to control pumps to deliver the precise performance required for an application. Turnquist said that the pump industry has been shifting toward stepper motor drives, which make it easier for OEMs to set up controls on the pumps. Hixson encourages OEMs to engage with his company as early as possible in the design phase. Providing details about the application helps suppliers ensure that their pumps meet the OEM’s requirements. The increasing specialization of medical devices requires custom-made pumps. But when KNF works with a customers, the company starts with a catalog product, which is then modified in a back-and-forth process with the customer to make the changes needed to develop a pump that suits the desired application. Wilson said that in many cases, meeting OEM objectives for products that are smaller, lighter, and less expensive can be achieved through this redesign work. KNF exchanges 3D model designs with customers to determine the right design. But in many instances, it helps for OEMs to bring the actual system to KNF because a 3D model won’t necessarily show the location of all of components of a device. Vanderbeck said suppliers benefit from learning about an OEM’s goals for an entire system—not just the pumps. When a pumps supplier has a comprehensive understanding of a system, the supplier can help OEMs find savings and efficiencies that they may not have envisioned. 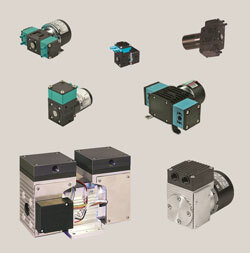 Ideally, pumps makers are involved early in the design process. But Vanderbeck acknowledged that sometimes a device maker engages a pumps supplier at the end of the design cycle, which limits the options available to the OEM. “If you come in at the end, all you can really do is deal with the decisions that have been made before because you’re already past the point of making those decisions,” Vanderbeck said.